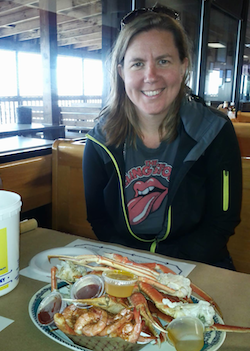 We recently split a pile of seafood and talked about Appygram & mobile apps with Alison Heittman, CEO and app developer at Solertium and one of the creators of Appygram. What does Appygram do for me? Appygram makes adding communication services to your apps really easy. Things like feedback forms, surveys, and stack traces. But it doesn’t just consume them; it’s also a powerful tool for managing where you want specific messages to go via email and webhook. For example, if you are adding a user feedback form to your Android or iOS shopping app, you can break the feedback down by topics like My Account, My Order, App Support, and General Feedback. If the user is logged in, you can query your other data from the app and pre-fill in their name, email, and phone fields, and append some extra data like recent order information. Then you decide where the messages go. So, all the My Account and My Order feedback can get routed via webhook to Customer Service’s help desk, App Support messages can create tickets in the app developer’s issue tracking system and give them a heads up in their chat room, and General Feedback can forward messages via email to the Marketing department. Why would I want to give my users a feedback form? Good question - not all apps have to have a feedback form. I do think it’s good practice to give users a way to reach you if they have an account and data stored in the app, or pay for anything with the app, for example. You have their data or are handling their money, so it’s just nice to facilitate good contact between them and you, the customer service team, etc. There’s the added benefit that having in-app feedback gives your users a way to reach you directly if they’re having a problem with your app, one benefit may be that they’re telling you rather than the world at large with a detailed 1 star review in the App Store. And that contact via the feedback form is an opportunity to convert them into a raving fan. Why not just drop an email link in the app? We originally considered just doing that on our first mobile app project, which was a restaurant ordering app. It got nixed pretty quickly because we weren’t sure the users would know what information we’d need to help them in an email, and we had visions of lots of back and forth before we knew enough to solve the issue. We did drop in a widget from our developer help desk in the first release of the app, but swapped it out in favor of Appygram so that we could customize the form - not just the fields, but also the appearance; the widget from our help desk didn’t match the app’s look and feel. Changing to Appygram also helped when the time came to transition the bulk of support issues to the restaurant. We had wanted all the initial feedback to go directly to us, the developers, because we assumed the bulk of issues would be technical in nature and we wanted to be able to respond to issues quickly and push out new builds with fixes ASAP. But we also knew that within a short period of time we’d want to start pushing feedback directly to the restaurant’s customer support and marketing teams, and it would be nice if we didn’t have the extra step of forwarding them on by hand. Since you can’t force all your users to update the app and get a new build with a new email address, we knew we wanted something like Appygram that could be more flexible and make changes on the fly. Level of difficulty: how hard is it to add Appgyram to my app? Easy!! To create a feedback form in your mobile app, you just need an API key from Appygram and know how to create a form (HTML or JSON) There’s also a community-supported appygram-ti module if you’re building your app with Titanium, a cross-platform development tool chain for iOS and Android (and Windows Phone and BlackBerry, as well as hybrid and HTML5) apps from Appcelerator. The Docs section has more information on Appygram libraries. All the individual messages, or appygrams, get routed to Appygram.com. You set up where you want the appygrams to go from there. You can just log into Appygram and read them, but I find it easier to route things around to where I am. When I’m on a sprint, I often send them to the team’s Campfire chat room. If I’m under the cone of silence, I send my appygrams to either Assembla or Zendesk, depending on the app. And often I like to receive an email, too. I like that I can change the routings (and even the topic list) on the fly without having to redeploy the app. The base plan is called Freegan for a reason - it’s free. No monthly charge, and comes with 3 apps. The next plan up is $7/mo, and it comes with a few more benefits that are especially useful once you’re out of the development stage and have released your apps. There’s no obligation, you can cancel anytime. And now, we’re heading back to our lunch. You should go and sign up for your free Appygram account now!